Everyone will agree that long, black tresses add to the natural beauty of women. The greying of hair is an inevitable process and it usually starts in your 30s and 40s. However, for some, greying may happen prematurely. It can be due to a lot of factors ranging from imbalance of hormones to psychological conditions like shock and stress. 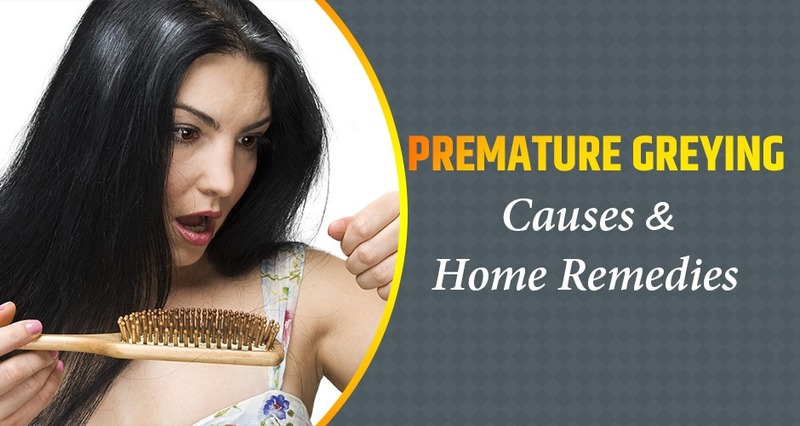 Premature greying of hair is a cause of concern because it is an irreversible change. Therefore, it is important for you to know the causes of hair greying, to be able to prevent or slow down the process. Low levels of copper, iodine, calcium, and iron minerals can lead to hair greying prematurely. During pregnancy your body diverts all the nutrients to meet the requirements of the growing fetus. After childbirth, when you are breastfeeding your baby for months, calcium content from your body gradually decreases. This may in turn lead to hair greying. A deficiency of Vitamin B12 in your body may also be the cause. Tension and stress affect our health adversely. It impacts our hair too. Stress can be in the form of fear, anxiety, or grief. Oxidative stress causes imbalance within our body. When you are stressed over a period of time, your body produces free radicals. They are unstable molecules which lead to aging and hair greying. During pregnancy there is a hormonal imbalance in your body. This can trigger greying. The results can be visible after a few weeks or months. If you have thyroid problems, the same can increase during pregnancy. This can also lead to decrease in the black pigment formation in hair follicles. Therefore, problems in your thyroid and pituitary glands may also lead to greying of hair. Some chemicals present in hair products like hair-dyes, shampoos, hair colour, etc. can lead to greying of hair. These products contain harmful substances which prevent the production of melanin, responsible for giving colour to the hair follicles. Hair dyes contain hydrogen peroxide which is a harmful component. Bleach present in some of the hair colouring agents may also trigger premature hair greying. If your scalp is unclean and you do not wash it regularly, you are more likely to experience premature hair greying. Smoking causes free radicals in your body. They reduce the production of melanin, thus resulting in hair graying. Smokers are two and half times more likely to experience premature hair graying than non-smokers. If your parents experienced premature graying of hair, there is a high probability that you will also. Some autoimmune diseases which attack the cells of our body, can also lead to early greying of your hair. You must consult a trichologist before beginning your premature grey hair treatment. In case its genetic, you can do little to prevent hair graying. However, if the trigger is external, like stress or lack of vitamins, you can opt for the following home remedies. Eating a diet rich in antioxidants can reduce oxidative stress on your body. Thus, it can aid in reducing premature greying. Some rich sources of antioxidants are fresh fruits and vegetables, green tea, olive oil, and fish. If you are facing premature hair greying due to deficiency of Vitamin B12, consume foods loaded with this Vitamin. Seafood, eggs, meat, milk and cheese are rich in Vitamin B12. Boil curry leaves in coconut oil. Massage your scalp with this mixture one hour before washing your hair. It acts as an excellent hair tonic and reduces premature greying and improves the overall health of hair. Cigarettes are known to contain cancer producing elements or carcinogens. They adversely affect our hair follicles as well. You must quit smoking to prevent hair greying. Powder three to four pods of shikakai. Add them to half a cup of sour curd and apply on your scalp. Leave it for 30 minutes before rinsing it with water. Massage your scalp every night with one tablespoon of amla juice, almond oil, and few drops of lemon juice. Add one tablespoon of iodised salt to a cup of strong black tea. Apply it to your scalp and all over your hair. Let it sit for an hour before washing it with water. Mix onion and lemon juice and apply it onto your scalp. Leave it for 30 minutes before rinsing it. Regular use will give results. The remedies mentioned above are helpful to delay or slow down hair greying. However, there is a growing trend in women for ditching the dyes and embracing their greys. In general. a positive attitude and stress-free lifestyle is a great way going forward.